Improve your desk comfort with Mount-It! ergonomic foot rest. Keep your feet and legs slightly elevated off the floor for better posture and less strain. Designed for use under a desk or table, the low-profile unit takes up minimal space, but provides substantial benefits. There are three adjustable tilt settings to ensure a great fit for your leg length. Tilt setting goes from 0 to 30 degrees. The large, non-skid surface prevents your feet from slipping off the foot rest while you're comfortably sitting at your desk during the workday. Adjustable height of between 4.3 to 6.7 inches can be modified via the foot pedal to let you stretch your legs for increased circulation and comfort. The foot rest comes with a textured round surface bumps for enhanced stress reduction during the work day. The uneven surface creates a massaging effect on the soles of feet. Simply move feet in any direction over the bumpy surface. Non-skid texture provides great grip, increasing feel, stability and control while your feet are resting on the oversized platform of 18 by 14 inches. ERGONOMIC OFFICE FOOT REST - Increase comfort at your desk. Keep legs and feet elevated for less strain and fatigue. Adjustable height and angle reduces pressure on lower back and alleviate discomfort while sitting. 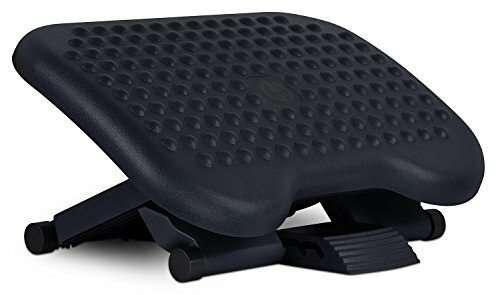 ADJUSTABLE HEIGHT FOOT STOOL - Convenient foot pedal control lets you adjust the footrest without leaving your chair. Offers three levels of height adjustment (4.3 in. / 5.5 in. / 6.7 in.) that lets you stretch your legs for increased circulation. TILTING UNDER DESK FEET SUPPORT - Adjustable tilt angle between 0 to 30 degrees tilt for best individual comfort. Surface bumps massage feet and improve circulation. DURABLE NON-SKID SURFACE - Non-skid support surface provides added control. High-impact plastic material for attractive design; perfect for use in modern offices. LARGE FOOT SUPPORT AREA - Foot platform measures 18 in. x 14 in. Enjoy ample foot space without slipping, sliding or moving under table or desk.